As Muslims prepare to erect a mega-mosque near the site of the 9/11 atrocities, it is well to reflect that the sort of tolerance, or indifference, that allows them to do so, is far from reciprocated to churches in the Muslim world. I speak not of Islamist attacks against churches—such as the New Year attack in Egypt that killed 21 Christians; or when jihadists stormed a church in Iraq, butchering over 50 Christians; or Christmas Eve attacks on churches in Nigeria and the Philippines. Nor am I referring to state-sanctioned hostility by avowedly Islamist regimes, such as Iran's recent "round up" of Christians. Rather, I refer to anti-church policy by Middle East governments deemed "moderate." Consider: Kuwait just denied, without explanation, a request to build a church; so did Indonesia, forcing Christians to celebrate Christmas in a parking lot—even as a mob of 1,000 Muslims burned down two other churches. If this is the fate of churches in "moderate" Indonesia and Kuwait—the latter's sovereignty due entirely to U.S. sacrifices in the First Gulf War—what can be expected of the rest of the Islamic world? The best example of anti-church policy is Egypt, where the Middle East's largest Christian minority, the Copts, lives. During Mubarak's tenure alone "more than 1500 assaults on Copts have occurred, without any appropriate punishment given to criminals or compensation to the victims," says Coptic Solidarity. For starters, Egypt's state security has a curious habit of disappearing right before Coptic churches are attacked—such as in the aforementioned New Year attack. They also tend to arrive rather late after churches are attacked: it took security "hours" to appear when six Copts were murdered while exiting their church last year. Considering that weeks ago an Egyptian policeman identified and opened fire on Christians, killing a 71-year-old—while yelling Islam's medieval war-cry, "Allah Akbar! "—none of this should be surprising. [U]nlike Muslim citizens, who only need a municipal license to build mosques, the Copts require presidential approval for a church … [and] the approval of the neighboring Muslim community. Even after obtaining licenses for a church, Muslims still attack Christians and demolish or burn their churches. A rumor that Christians are meeting to pray is enough reason for Muslim neighbors to carry out acts of violence against them. On various occasions, it only takes Muslims to protest against the building of a church for State Security to stop the works, under the pretext that it is causing "sectarian strife." 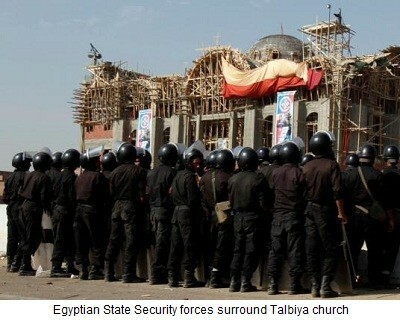 In fact, citing minor building violations, Egypt's state security recently stormed a partially constructed church in the Talbiya region where over one million Christians live without a single church. In the process, state security fired tear gas and live ammunition on protesters, claiming the lives of four Copts, including an infant (79 were severely injured, 22 blinded or semi-blinded, and 179 detained, including woman and children). One human-rights activist complained that the wounded Copts "were shackled to their hospital beds and then sent to detention camps." All this is exacerbated by well-connected Egyptian Muslims who issue fatwas comparing the building of a church to the building of "a nightclub, a gambling casino, or building a barn for rearing pigs, cats or dogs"; or who appear on Al Jazeera ludicrously accusing Copts of stockpiling weapons in their churches and torturing Muslim women in their monasteries. Incidentally, all this was under the "secularist" Mubarak. As for Egypt's current power-holders, the military, armed forces just stormed a 5th century monastery, opening fire on monks to chants of "Allah Akbar!" (see video here). Consider the fate of Copts should the Muslim Brotherhood assume power. Such, then, is the plight of Christians and their churches in the Muslim world—and such is the irony: while mosques, some of which breed radicalization and serve as terrorist bases, start dotting America's landscape, churches are on their way to becoming extinct in the Middle East, the cradle of Christianity. More pointedly, as America allows Muslims to build a mega-mosque near Ground Zero—which was annihilated by Islamists partially radicalized in mosques—America's "moderate friends" in the Muslim world blatantly persecute Christians and their churches. Such flagrant double standards are—or should be—unconscionable. Yet here we are. Is it any wonder, then, that the Western mindset has a long way to go before it understands how to deal with the scourge that is "radical Islam"?